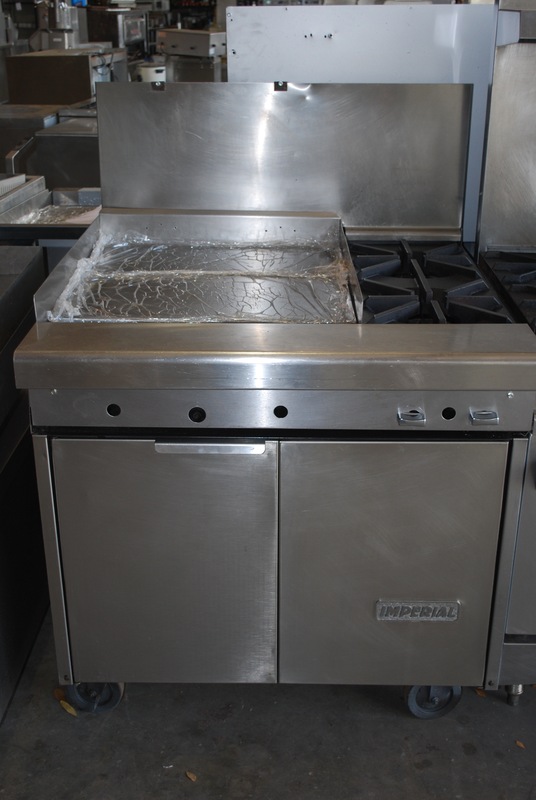 One of the most popular brands sold by One Fat Frog Restaurant Equipment is Imperial. Imperial makes a variety of products including range ovens, fryers, and more. Imperial is a very reliable, high-quality brand that One Fat Frog Restaurant Equipment always recommends to customers when we have Imperial pieces in. Just arrived at the One Fat Frog Restaurant Equipment warehouse in Orlando is this awesome, used Imperial 2-Burner with a 24″ raised griddle. This piece is perfect for chicken, steaks, pancakes, sausage, or anything else you can imagine cooking on a flat griddle with two great burners for back-up! This used Imperial 24″ flat griddle with 2-burners comes with a 30 Day parts and labor warranty and One Fat Frog Restaurant Equipment’s famous technician cleaning, refurbishing, and testing. One Fat Frog Restaurant Equipment welcomes quick cash deals and package deals on the entire stock of used commercial restaurant equipment – including this 24″ Imperial flat griddle. Come by and check it out today!